An errand along the Serpent River exposes the characters to the dangers of the Scourge. Searching a tomb for magical treasure, the heroes find that not everything evil is dead. In the depths of the Servos Jungle, an expedition takes a different direction when the heroes encounter the Therans. Beneath the Kingdom of Throal, an underground village harbours thieves. But why are they stealing food from the bazaars of the dwarf city? The heroes take part in the annual tournament of Travar the outcome of which determines the city's political fate for the coming year. 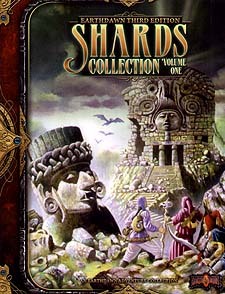 Shards Collection Volume One is a collection of five stand-alone adventures for Earthdawn Third Edition, providing challenges for Novice through Journeyman adepts. Require use of the Earthdawn Player's and Gamemasters Guides.